“Baby Katherine and Daddy.” Photo: Flickr user Joshua Smith. Preterm birth is the leading cause of neonatal death, and increases the chances of disabilities and developmental delays in those infants who survive. Join Dr. Jay Butler, co-host of Line One: Your Health Connection, for a discussion with Dr. Lily Lou on the state of the art of the care of the premature infant and prevention of premature delivery. 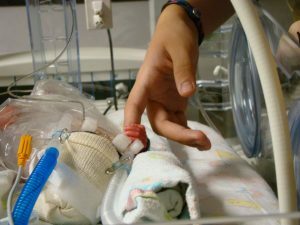 Preemie Voices: Live from ScottLevely on Vimeo. Dr. Lily Lou is a board-certified pediatrician specializing in neonatology. She practices at the Children’s Hospital at Providence in Anchorage. Premie Voices Live. Video made by Dr. Saroj Saigal of the McMasters Hospital in Hamilton, Ontario provides the stories of 10 persons who were born prematurely, weighing less than 2 pounds at birth, outlining their challenges and achievements through childhood and into adulthood.